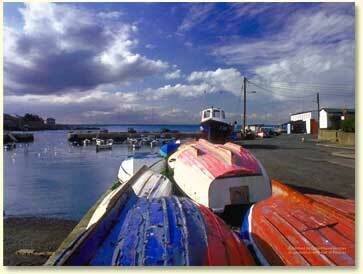 Dalkey village is a small intimate village with lots to offer. Restaurants to suit all tastes – Italian, Chinese, French, Indian, Thai and plain home cooking if that is what you want. Pubs a plenty for the Guinness drinkers, and other beverages, of course. There are shops and hairdressers, craftshops and galleries, a bookshop, a post office, antique shops – everything you might need – all within 5 minutes walk from Dalkey Lodge. If you are in to outdoor pursuits, you can participate in any of the local maritime activities such as windsurfing, sailing, fishing, scuba diving and water skiing. Lovely walks, which will take you, if you choose, to the coast or the hills where the views are simply breathtaking. If you wish to play golf or tennis, swim, go to a gym or horse ride, we have to be honest, you will have to go a little further, but we can organise all that for you. There are a least 6 golf clubs within 5 miles of the house. Or else you can relax, eat superbly at home or elsewhere, and do nothing. There is public transport, should you need it, which will take you into Dublin City in about 30 minutes by train.